JETIN cc t/a AfricaTuff OEM manufactures JETIN Water Blasting Pumping Systems as well as being the JETECH Master Service Distributor for Africa, also under licence, manufacturing a wide range of water blasting pumping systems and accessories for the world export market. High pressure water blasting has been the core of our business since 1994. We have serviced thousands of customers and organisations. At AFRICATUFF we are fully committed to your operational success and safety. We facilitate you with the best that our industry can offer. We are a dynamic company that focuses on turnkey solutions for all your industrial equipment, tooling, accessories, and PPE requirements. We specialise in Ultra High and High Pressure Water Jetting / Blasting ( hydroblasting ) systems, mobile or onsite installation, custom engineered for all industries. The UHP and HP pumping systems that we manufacture and supply are capable of cutting through concrete and steel, stripping paint off any surface, heat-exchanger cleaning, and many other applications related to every industry. With over 20 years experience in the industry, AFRICATUFF is well positioned to offer all its customers expert advice on all aspects relating to High Pressure (HP) and Ultra High Pressure (UHP) Water Blasting services and solutions. Being an Original Equipment Manufacturer of High Pressure and Ultra High Pressure water blasting and hydroblasting solutions, equipment and accessories, we provide state of the art knowledge, products and services. We offer you complete and unique solutions for all cleaning applications. We develop, design and engineer cleaning solutions, both for standard and specific applications. We operate and produce according to the highest industrial standards. AFRICATUFF is your quality partner in the industrial cleaning industry and a specialist in High Pressure and Ultra High Pressure water blasting. Whatever your needs, standard or special, we are able to consult and serve you on every level. From the tiniest spare part up to complex engineering challenges, from pumps and units up to training and special product development. We provide safety, innovation, quality and training for every water blasting professional and contractor. We facilitate you with the best that our industry can offer. And more. Our mission is to be recognised, known, experienced and appreciated as the most reliable service and solutions provider in Africa for high pressure and ultra high pressure water blasting solutions and accessories for industrial cleaning objectives. We want to make your work easier, safer and more efficient with high pressure water jetting. Products & Solutions: AFRICATUFF offers total solutions, systems and all necessary accessories for high pressure and ultra high pressure water jetting. 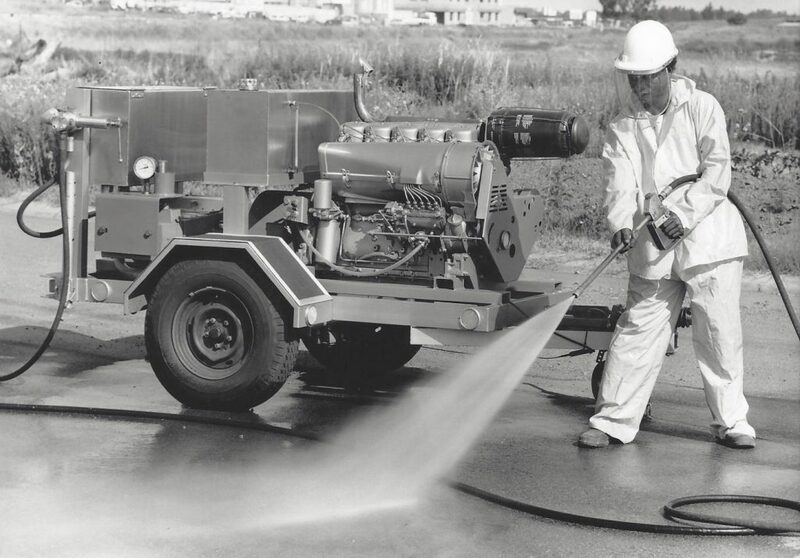 Water Jetting is a rapidly growing technology used in the industrial cleaning and surface preparation industry. We have a wide range of water jetting pumps and accessories to maximize any water jetting application. More importantly we have the expertise and correct global partners, namely JETECH and Bingham Industries to offer any solution you may require. We supply the industries largest range of 40,000 PSI water jetting parts, as well as a diverse range of 20,000 PSI & 15,000 PSI parts, all at unbeatable prices. We have a diverse line of air rotational guns and drive units, as well as tumble-boxes, foot valves, pressure regulators & much more. Our USA-made line of replacement parts can be used on all major pump brands. We offer private label hoses, made specifically for AfricaTuff from 15,000 PSI to 44,000 PSI as well as a variety of other safety products. AFRICATUFF offers professional training programs, both theoretical and practical. These training programs are developed and based upon 20 years of expertise. Training and instructions are provided on site at the customers, or at our own premises. Our training facility and all our training procedures are in accordance to the required safety standards. AFRICATUFF complies with international Safety standards. We adhere to and represent the world’s leading Water Jetting Protection Companies. Our workshop is geared up for manufacturing all types of Water Jetting pumps. We also do repairs and maintenance to pumps and other Water blasting associated equipment. 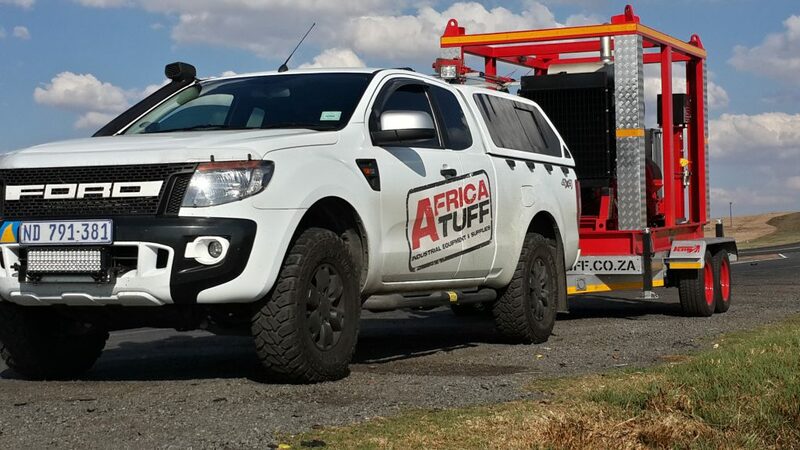 AFRICA TUFF in partnership with TUFF HYDROBLASTING offers a perfectly maintained rental fleet, with a large program of accessories up to 2800 bar, providing a perfect solution for almost every project. Recommended Application: Fuel B, Crude Oil, Diesel Fuel, Hydraulic Fluid, JP4, JP5, Kerosene, NAFTA, Petroleum Heavy Cat Crack, Water.